MEDICAL records of 30,000 men who fought along the Western Front have been newly-transcribed to mark the centenary of the devastating First World War battle of Ypres. 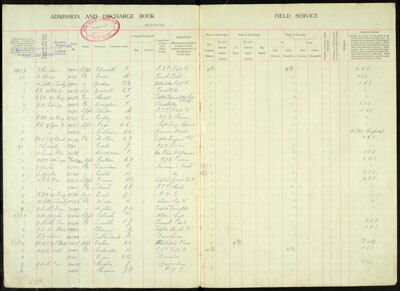 These rare accounts, from the 51st Field Ambulance, are just some of the 1.5 million that were recently discovered. Apart from documenting the men’s names, Service and medical details and movements, they also shed light on a grisly line-up of the top 20 most common injuries and ailments suffered by the men. Expected conditions such as trench foot and mustard gas poisoning were joined by more surprising ones including lice (97 per cent of men were infested), scabies and sexually transmitted diseases. A free e-book, Trench Traumas and Medical Miracles, compiled by Forces War Records’ researchers, explains and adds further context to these rare documents. It also catalogues the legion of problems, including self-inflicted wounds, seen by medical practitioners on a daily basis, with many soldiers suffering from a combination of conditions at once. The e-book also describes some of the pioneering inventions dreamt up during the conflict such as mobile X-ray units. In contrast, a number of highly improbable “medical recipes” are shown, including one for “Weakness and Nervousness” comprising quinine, ginger, rosemary leaves and dilute sulphuric acid. Apart from the excruciating suffering described from the frontline, the e-book also highlights ordinary but very touching moments such as a letter of thanks from a hospital orderly to a schoolgirl who’d sent them a basket of eggs.